Recently the inimitable Roger Smith wrote a pair of articles referencing conversations we had during the LSC Innovations in Technology Conference that was held in New Orleans in January of 2018. I apologize for the frank, but malapropos expression “sleeping with Google”. Let me expand on my thinking a little more. 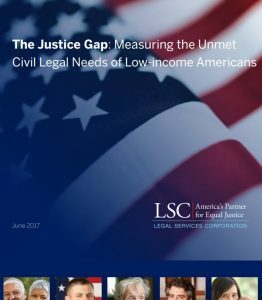 According to a 2017 LSC report, 86% of low income people with a legal problem receive inadequate or no professional legal help. That’s a justice gap! These “non-seekers” either don’t know they have a legal problem, don’t know their problem has a legal solution or don’t trust lawyers. They also might be inhibited by despair, depression, language or disability. When people do seek legal assistance, one study shows that they do so only 13% of the time. In contrast, they talk to family or friends more than a third of the time. Since some do both (8%), we might say 21% are looking online for assistance. Where do they go? Search engine market share (visited 1/24/18) shows 3/4 go to Google. You may have noticed that when you search certain categories of information on Google, you not only get a list of results, you get a special interface that is relevant to the category of information being searched. For example, searching a current movie title will result in movie theatres where it is playing. Searching an unusual word will result in a dictionary definition. Searching historical facts will result in a Wikipedia link in the sidebar. Searching a medical condition will often yield links to WebMD, Mayo Clinic or other relevant and authoritative source. What if you search a legal problem? You will often find articles or links to a legal aid website, law firm or court self-help article. The results most often look like what you expect from Google – a list of results. There is no special sidebar or treatment for legal problems. Why not? Can we change this? Many times I have heard about excellent, innovative legal self-help websites and tools that languish for lack of use. They all struggle to find their online audience. If you have the budget, you resort to IRL advertising on billboards, public transportation, brochures, etc. We are all trying to find the eyeballs anywhere we can. Most legal self-help seekers eyeballs start with Google. The biggest legal-assistance-finding system in the world is Google, so we should start there. The efforts to create a single source website that triages self-help seekers – whether through AI, expert system or whatever, seems like a rational approach, though it suffers from the same problem that all brand new websites do – finding its audience. Theoretically, if we all shout as loud as possible about this single point of finding everything to do with legal self-help, that will create enough noise to direct SRLs or it will create a large enough presence for Google to rank it high in its search results. The efficacy (and admittedly, the fallacy) of Google is that you get a exactly one empty box to type in some words and then you get a list of answers. Scan, click, happiness! A triage system intercedes to get clarification on just exactly what you are looking for – even if you don’t know yourself. The challenge is whether we can do this in the face of the expectation of the click-and-done culture of the web. Why should we feed the Google beast? Google is a commercial entity who will doubtless want to monetize the searches and profiles of the very SRLs we are trying to serve. The short answer is the same as when a reporter asked Willie Sutton why he robs banks. His reply was “Because that’s where the money is.” Google (and all of the online media giants) use personalized information like location, socio-economic status and browsing history to categorize us for advertisers. We can help this along by getting very smart about SEO, using Google Sitemaps and developing our own user-centric vocabulary (I almost said taxonomy) that Google and others can adopt as a way to provide up-to-date information. 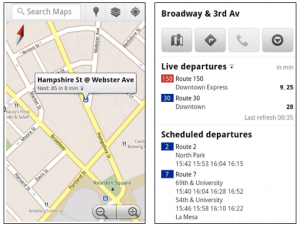 A good analogy here is how Google came to create the General Transit Feed Specification (formerly Google Transit Feed Specification) so that they could include timings for buses and trains in Google Maps. We need a similar spec for legal aid that improves on previous attempts like the Legal Services National Subject Matter Index. Maybe the Microsoft-LSC-Probono.net Triage Project is covering this ground. They will certainly need some kind of taxonomy to organize the myriad legal problems that people will expect it to address. 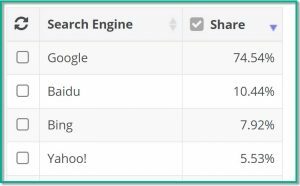 It’is also an opportunity for Bing (7.92% search engine market share) to close the gap on Google. I don’t know if anyone from the Bing team is on this project, but it would be a really good idea. The goal here is to get SRLs to the best possible resource for their legal problem, location, economics, and ability to manage it. If triage is a giant tree with branches, these are the leaves. There need to be tens of thousands possible endpoints that are useful to 100% of the searchers as mandated by the Report of The Summit on the Use of Technology to Expand Access to Justice. These could be articles, checklists, A2J Author Guided Interviews, HotDocs templates, agency referrals, legal aid intake portals, videos, etc. There is still a lot of work to be done creating these resources that a national triage system will deliver up. Under an LSC TIG grant, CALI and Chicago-Kent College of Law examined the landscape of automated forms and found that less than 20% of the most requested or popular forms have been automated. Everything has been automated somewhere, nothing has been automated everywhere across all 50 states. 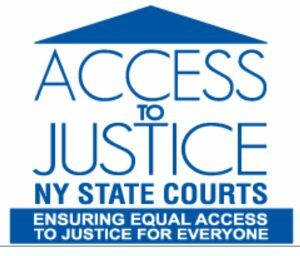 We know that automating forms are a successful and popular action from the thousands of user testimonials at the New York Family Court’s DIY forms website. Over 100,000 people a year use A2J Author Guided Interviews and are surveyed about their experience. Thousands have responded positively. Go ahead and read some these, they will warm your heart. Maybe we don’t have to sleep with Google or Bing/Microsoft but we should certainly swipe right and see if they want to get coffee sometime. Search engines are the primary way that the public seeks legal information. Every single website or service we build will have to fight to get the attention of very distracted eyeballs. Why not find those eyeballs where they start searching? Sleeping with Google: what might that mean?